Mini dental implants are an option for patients looking to replace lost teeth but who don't want (or can't receive) conventional restorations. Some people don't want the invasive surgery required for regular implants, whereas others lack the bone mass in their jaws to hold them. Dentists can replace missing teeth with bridges, dentures or dental implants. Bridges and dentures are false teeth that sit on the gum's surface, but dental implants are inserted into the jawbone so that they aren't removable. To start, the dentist conducts a surgical procedure to place a titanium post (abutment) into the bone of the jaw, and the bone fuses around the abutment over three to six months. Once the abutment is fused to the bone, the implant is uncovered and then a small post is attached to the implant and then acts as an anchor for artificial teeth to be attached to. You might prefer dental implants to dentures because they don't shift or slip in the way dentures sometimes do. For the best results, though, you should simply have sufficient healthy bone in your jaw. Mini dental implants have the same structure as regular implants but are slightly smaller in form. 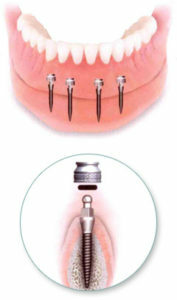 These mini implants have two parts: a titanium post with a ball on the end, and a socket with a rubber O-ring that attaches the tooth to the post. Regular implants are 3.4 to 5.8 mm wide, but mini implants are 1.8 to 3.3 mm in diameter and 10 to 15 mm long. Mini implants support most types of replacement teeth. The MIDCA points to dentures, bridges and fixed crowns, but the American Academy of Implant Dentistry says mini implants are also suitable for securing loose and lower arch dentures. Receiving regular implants takes several months and requires at least two dental appointments. Certain treatments require additional visits for bone-grafting to supply sufficient bone to support the implant posts. Still, other patients aren't able to undergo invasive surgery and repeat dental appointments or have lost too much bone mass in their jaws to receive a full-sized implant, and this is perfectly normal. In these cases, mini implants may be the best option. Dentists can usually install mini implants in only one visit using local anesthesia and without any sutures. Better yet, you can use your new teeth that same day. Mini dental implants require the same care as natural teeth. Floss once a day, and brush twice a day with a fluoride toothpaste. While the gums are still sensitive after the dental implant procedure, use an extra soft-bristled toothbrush. Losing natural teeth can be fairly traumatic, spoiling your confidence just as much as your smile. Mini dental implants allow you to speak and eat normally again without worrying about how this accident could affect your daily routine. Your dentist can tell you if mini implants are the best choice for you.